This is a brand new series in which we relive the 1982 World Cup day-by-day. Join us as we look at each game in depth and see the tournament build as if it were happening now. This will take us right up to the Russia 2018. This was the second World Cup I watched and still remains my favourite. There is a saying the World Cup you remember most was the one you watched when you were around ten years old, yet I was that age when the 1978 tournament in Argentina took place. But the tv coverage then was patchy, and with some of the matches being broadcast late at night I had no chance of getting to see them. Two other reasons for 1978 failing to quite do it for me, was only Scotland qualified from the home nations, plus there were no standouts sides. There was no ‘total football’ from the Dutch, despite their retention of many players from 1974, and the absence of Johann Cruyff clearly affected them greatly. Brazil, despite containing Zico and Rivelino, were a shadow of the 1970 side. 1982 was an expanded format with twenty-four sides competing rather than sixteen as had been the standard since 1950. With the advancement in television coverage, matches played at times more acceptable to a viewer in England, this tournament was bigger, better and blatantly more colourful. Add to that, three home nations qualified, England, Scotland and Northern Ireland it was an infinitely more attractive tournament for me than the previous one. The football was of a much higher standard than four years before, and not only did we see a Brazilian side which still remains one of the most exciting international teams I have ever witnessed, but also France, West Germany and Italy played some attractive football. Many players’ reputations were forged in this tournament, with players such as Socrates, Falcao, Eder, Pierre Littbarski, Jean Tigana, Alain Giresse, Gaetano Scirea, Antonio Cabrini and Diego Maradona, all made their entrance on the world stage here. Players such as Karl-Heinz Rummenigge, Michel Platini, Zbigniew Boniek and Paolo Rossi had all appeared in 1978 but were now moving towards their peak as they began to dominate world football. Another personal reason for this tournament remaining special for me, was that I am youngest in a large family, with all my brothers a lot older than me. In 1978 world football was still full of players from my brothers’ era, such as Cruyff, Breitner, Bettega, Rensenbrink, Neeskens and Krol, with the names of Beckenbauer, Pele and Muller still mentioned in many quarters. 1982 felt like the beginning of a new era. The 1980 European Championships had been won by a West German side full of many new players, and by 1982 they had enhanced this team further. So, this felt like ‘my World Cup’ for my time. 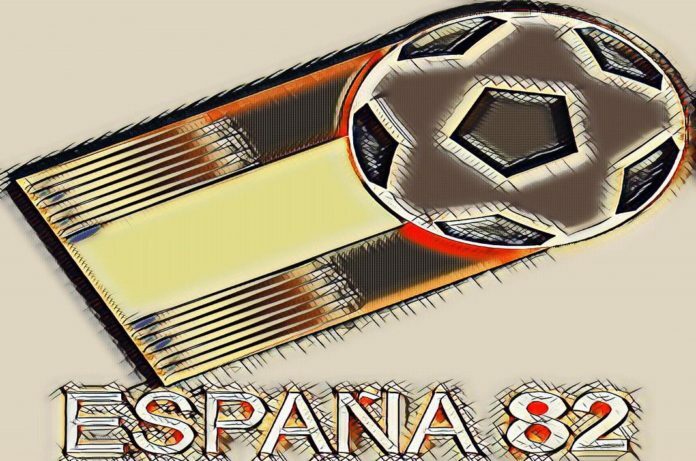 Spain was chosen as the host nation for this tournament as far back as 1966. At the time the hosts for 1974 and 1978 were decided as well, and Spain had agreed a deal with West Germany they would support them for the 1974 tournament, in return for German support for 1982. We have now become used to the build-up of major sporting events being full of claims such as “the hosts aren’t ready”, and “stadiums may not be completed on time”, but back then this was fairly uncommon. There were concerns over Spanish stadium workers threatening to strike during the finals over pay and conditions. As late as a week before the World Cup was due to kick-off, Spain’s leading newspaper, El Pais, describes Mundial ’82 as ‘the great national disaster’. Grounds are still being finished, ticket sales are disappointing, and the organisers merely hope to break even. In addition to domestic disputes, there was another major international incident which threatened to affect things. The Falklands War was in progress. Argentinian forces had invaded the Islands, governed by Britain, in an attempt to take control. Britain had responded by sending a naval taskforce to repel them. This made things very difficult for FIFA. With three British nations due to complete in Spain, there was uncertainty as to whether the British Government would ‘allow’ them to take part. The government had already given a directive there should be no contact between British representative teams and Argentina, when hostilities began in April. FIFA had subsequently advised the Government there was no prospect of Argentina being asked to withdraw, particularly as they were the defending champions. For a while the Government had taken the view it would be up to the football authorities in each country to decide what to do. But then casualties increased and there was concern the Government would take matters into their own hands. They ultimately decided a withdrawal would provide Argentina with a wonderful propaganda opportunity and when it became obvious no other countries would withdraw in support of the home nations, all of them competed as arranged. Things weren’t particularly easy for the Argentinians either. As holders they only had friendlies to play. Just before the tournament they beat Bulgaria and Romania which ended a run of six games without a win. But for the players they had been exposed to their own media coverage of the Falklands War and the message at home was very much that Argentina was winning, and the War would soon be over, with the result in their favour. When they arrived in Europe, they found the story a completely different one to get used to and realised their countrymen were dying in the conflict. The team found it difficult to concentrate, not really knowing what was happening back home. Italy was another team in some uncertainty. Managed by Enzo Bearzot, they’d spent the past four years re-building the side which finished fourth in Argentina. Italian football had been rocked by a match fixing scandal which claimed their star striker, Paolo Rossi, who was banned initially for three years until 1983. The ban was appealed and eventually reduced to two years, but Rossi didn’t return to professional football until the end of April 1982. He played one international, away to Switzerland, before the tournament and looked horribly short of match-fitness in the early games. He was almost dropped for the Brazil match which would be the making of him. With the expanded tournament came some teams who had never competed in a finals tournament before, such as Algeria, Cameroon, Honduras, Kuwait and New Zealand. To date, for El Salvador, Kuwait and Peru it is still the last time they competed in at the finals. Probably the biggest influence for me was we were now out of the 1970’s football, with its dull, defensive mindset. The 1970s with its Formica, brown furniture, flares and endless strikes. The 1970s had taken international football down a dark sullied passage which was signposted “don’t go in that direction as you might concede a goal, and then you’ll have to score two”. 1980s football, with its colour, hairstyles and sunshine just seemed to be all the more appetising and positive. But don’t get me wrong, it wasn’t all sweetness and light, but when you look back at your childhood it’s always sunny, isn’t it? Maybe the only reason the 1982 World Cup was a joy to remember was because there was an exciting Brazilian team to watch. Football is always a joy to watch when the Brazilians are in form as they play the game so well, there’s so much fun and laughter. There was no fun and laughter in 1974 or 1978, but 1982, with its French midfield, the relentless German efficiency and the tactical nous of the Italians. Not to mention the naïve exuberance of the Algerians, Cameroons, and above all else – the Irish. Has there ever been a host nation who has suffered as embarrassing a loss as the Spanish did against the plucky Irish from the North? A team filled with wily old professionals who’d been around the block many times, yet still found a place for the youngest player in World Cup history. For England it was a journey which ultimately lead to disappointment, but they could hang onto the stats which say, played 6, lost 0, and the only goal they conceded came midway through the first half of their first match. They beat the French, and the Germans couldn’t break them down either. But for England the story was of them not quite understanding the format. Just get through the group stage and worry about things later, as the Germans, Italians and French did. Once into the second round, you need to be clinical, and the English do not do ‘clinical’, certainly not under Ron Greenwood. Had West Germany and Austria not arranged their match then England might have been playing the Austrians who were decimated with injuries, come the second phase. But the biggest reason for England’s failure to make the Semi-Finals was the fitness of Kevin Keegan and Trevor Brooking. England never lost a qualifying match when those two were playing together. They rescued the campaign in Budapest, yet when it came to the finals both were injured they were only able to make an appearance for the last thirty-five minutes of the final match. Yet Keegan almost won it as his header went agonisingly wide. He got blamed for that, as often Keegan did, whilst the fact Mariner, Francis & Woodcock had failed to get a goal between them for 270 minutes of the competition. So, join me as we re-live the 1982 World Cup – day by day. It’ll just like being there.